Welcome to ExpressTruckTax. 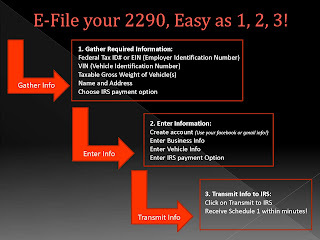 Now that you have created your ExpressTruckTax account, you can E-File your Heavy Vehicle Use Taxes with the IRS form 2290 in just a few minutes. This video walks you through the simple process of E-Filing your Form 2290. The entire process takes only minutes. Receive your Stamped Schedule 1 and be on your way. Now that you have created your ExpressTruckTax account, you can E-File your Heavy Vehicle Use Taxes with the IRS form 2290 in just a few minutes. The 2013-2014 Heavy Vehicle Use Tax Year is under way and E-Filing Form 2290 with ExpressTruckTax is quick and easy. The whole process is just 4 easy steps. Our user friendly program allows you to E-File Form 2290 for as little as $9.90 and you will receive your Schedule 1 in just minutes! To get started today, go to ExpressTruckTax.com or contact our Express Tax Support Center in Rock Hill, SC at 704-234-6005 or email us at support@ExpressTruckTax.com. We have Spanish Support too!